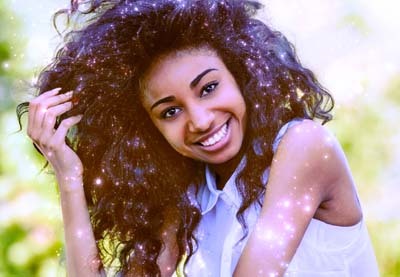 In this tutorial, you will learn how to create a sparkle photo effect. I will explain everything in so much detail that everyone can create it, even those who have just opened Photoshop for the first time. 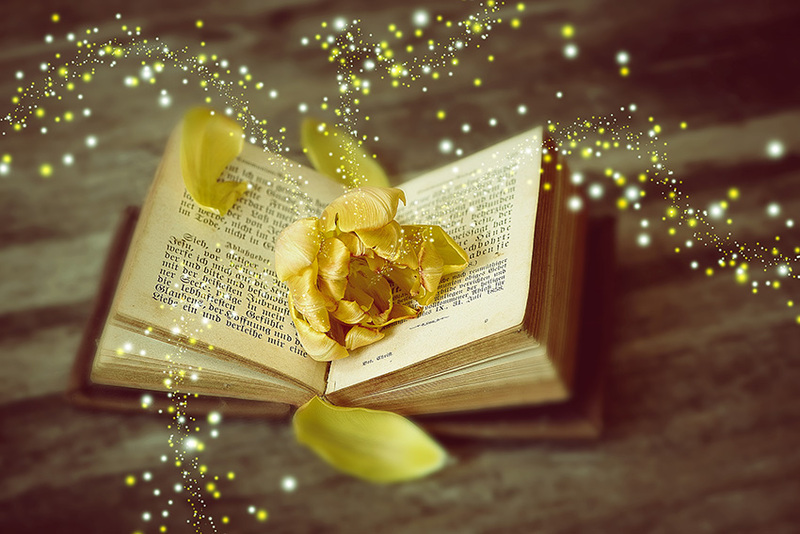 The effect shown above is the one I will show you how to create in this tutorial. If you would like to create the even more advanced magic dust effects below, using just a single click and in only a few minutes, then check out my Magic Dust 2 Photoshop Action. Now to define this brush with new settings as a new brush, click on the top right icon in the bottom right corner of the Brush panel, and name it Sparkles. In this section we are going to create the sparkles. Go to Layer > New > Layer to create a new layer and name it Sparkles_Small_1. Go to Layer > New > Layer to create a new layer and name it Sparkles_Small_2. Then, drag this layer just below the Sparkles_Small_1 layer in the Layers panel. Go to Layer > New > Layer to create a new layer and name it Sparkles_Medium_1. 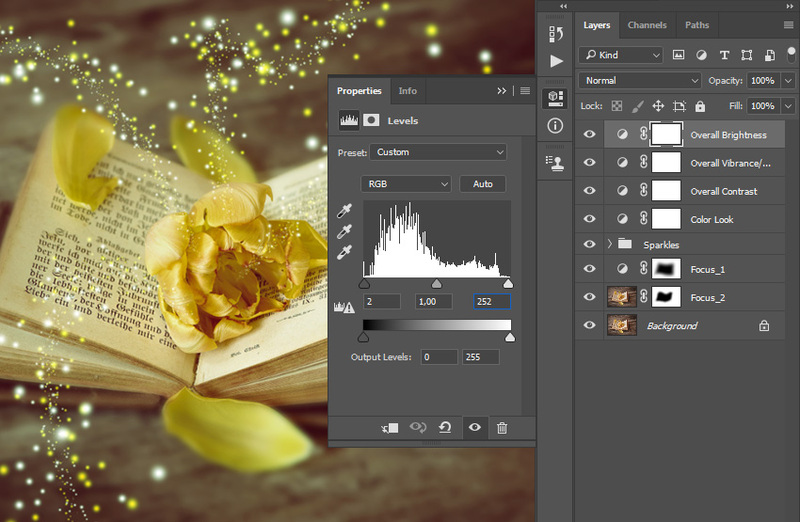 Then, drag this layer just below the Sparkles_Small_2 layer in the Layers panel. Go to Layer > New > Layer to create a new layer and name it Sparkles_Medium_2. 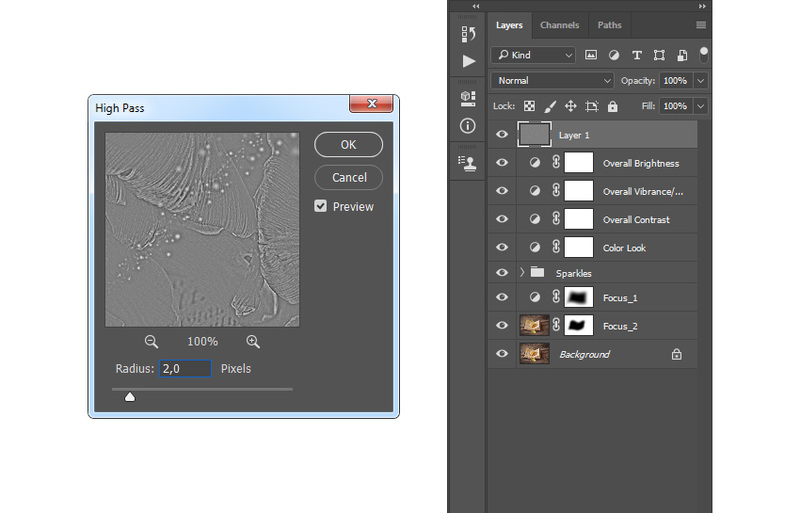 Then, drag this layer just below the Sparkles_Medium_1 layer in the Layers panel. 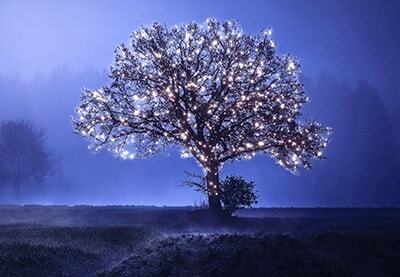 Go to Layer > New > Layer to create a new layer and name it Sparkles_Large_1. 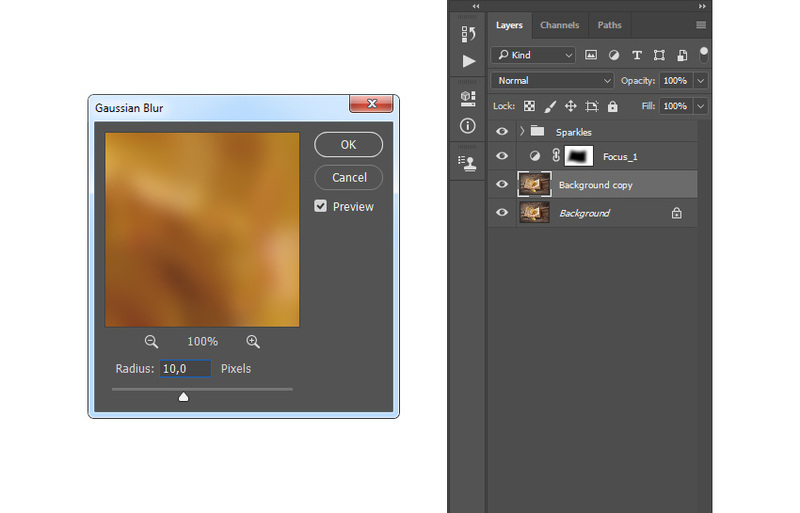 Then, drag this layer just below the Sparkles_Medium_2 layer in the Layers panel. Go to Layer > New > Layer to create a new layer and name it Sparkles_Large_1. Then, drag this layer just below the Sparkles_Large_1 layer in the Layers panel. Now press Control-Alt-G on your keyboard to create a clipping mask. 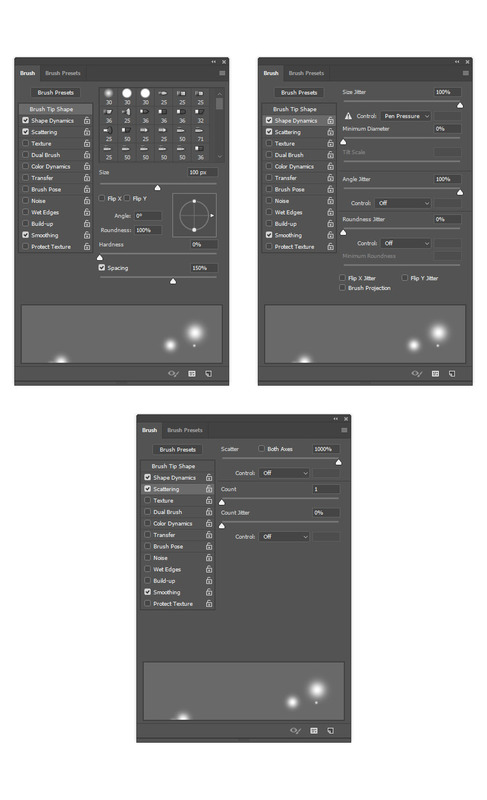 Then, select the Sparkles_Small_1 layer and change the Blending Mode of this layer to Linear Dodge (Add). 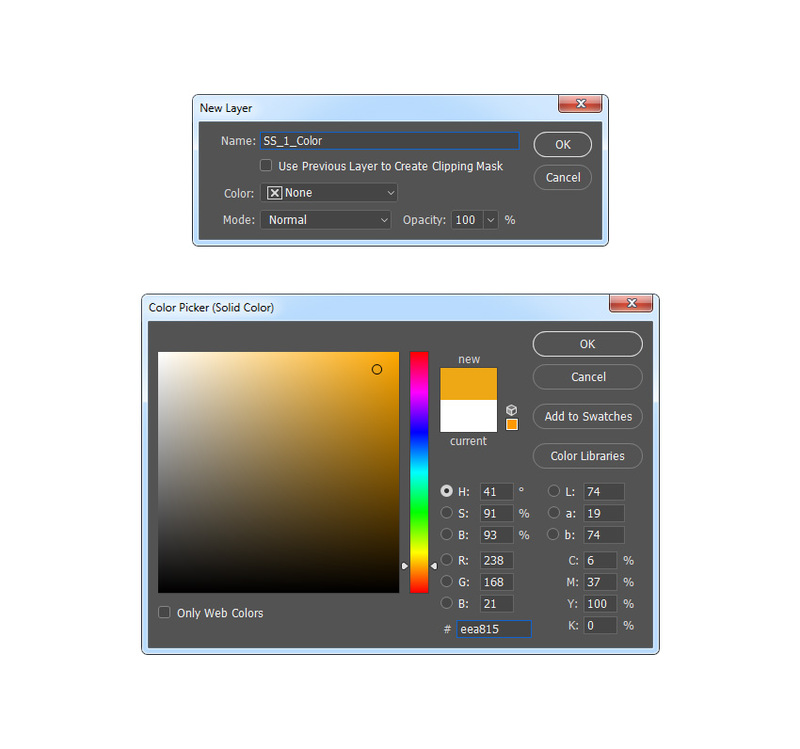 Select the SS_1_Color layer and press Control-J on your keyboard to duplicate it. Then, drag this layer just above the Sparkles_Medium_1 layer in the Layers panel. After that, press Control-Alt-G on your keyboard to create a clipping mask. Now name this layer SM_1_Color. Then, select the Sparkles_Medium_1 layer and change the Blending Mode of this layer to Linear Dodge (Add). Select the SM_1_Color layer and press Control-J on your keyboard to duplicate it. 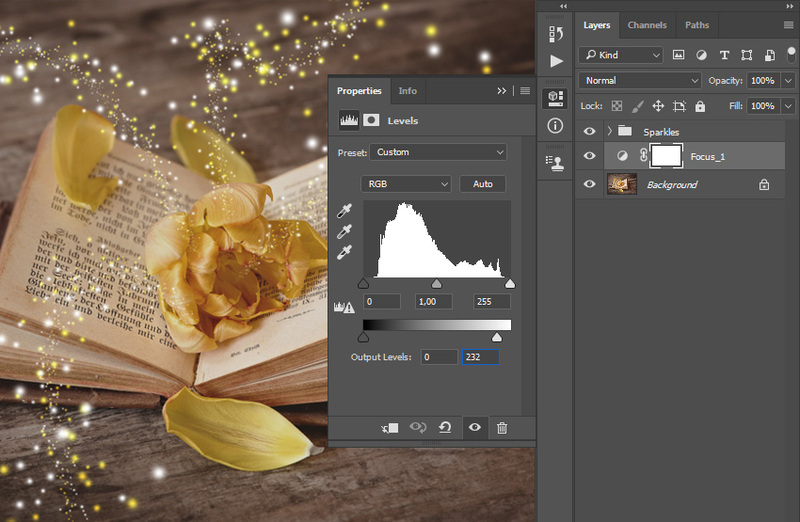 Then, drag this layer just above the Sparkles_Large_1 layer in the Layers panel. After that, press Control-Alt-G on your keyboard to create a clipping mask. and change the Blending Mode of this layer to Linear Dodge (Add). Select the SS_1_Color layer and Shift-click on the Sparkles_Large_2 layer to select all layers between. 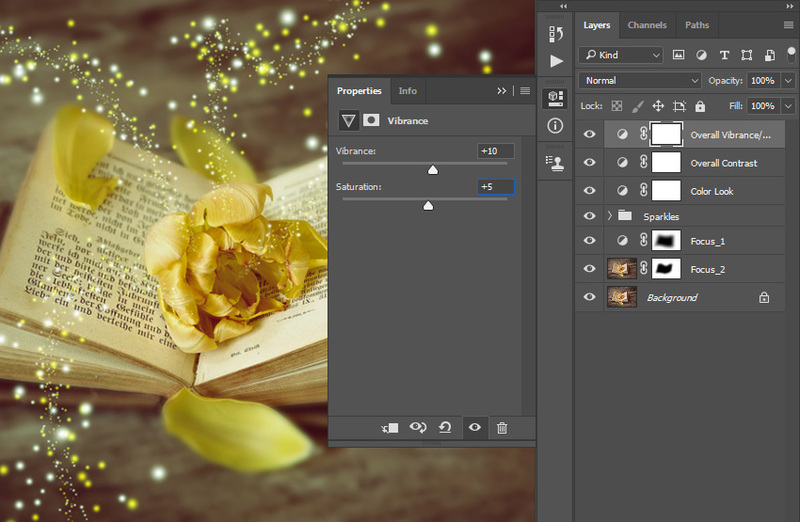 Then, go to Layer > New > Group from Layers to create a new group from the selected layers and name it Sparkles. In this section, we are going to create the focus. 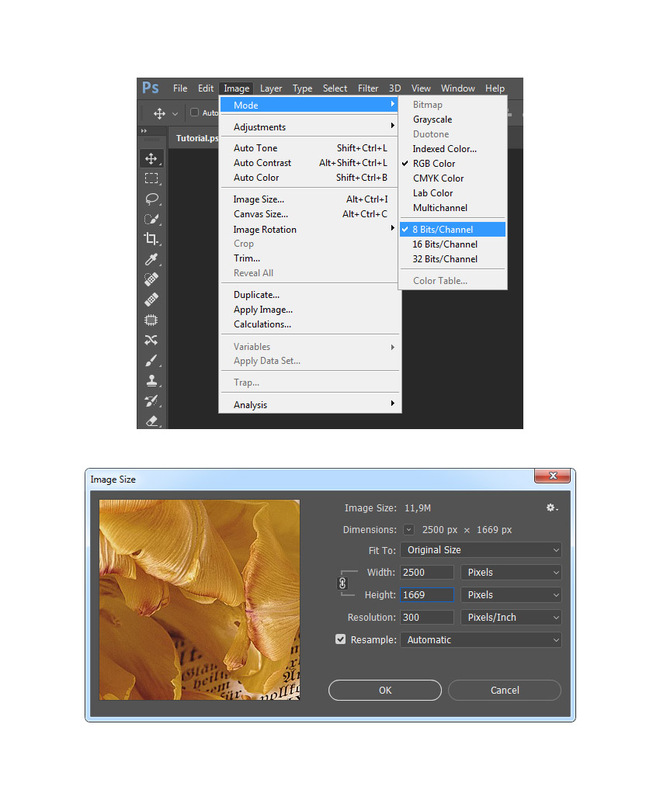 Select the Background layer, go to Layer > New Adjustment Layer > Levels to create a new levels adjustment layer, and name it Focus_1. Now select the Background layer and press Control-J on your keyboard to duplicate it. Then, go to Filter > Blur > Gaussian Blur and set the Radius to 10 px. Go to Layer > Layer Mask > Reveal All to add a layer mask that reveals the whole layer. Now name this layer Focus_2. In this section, we are going to make final adjustments to the design. 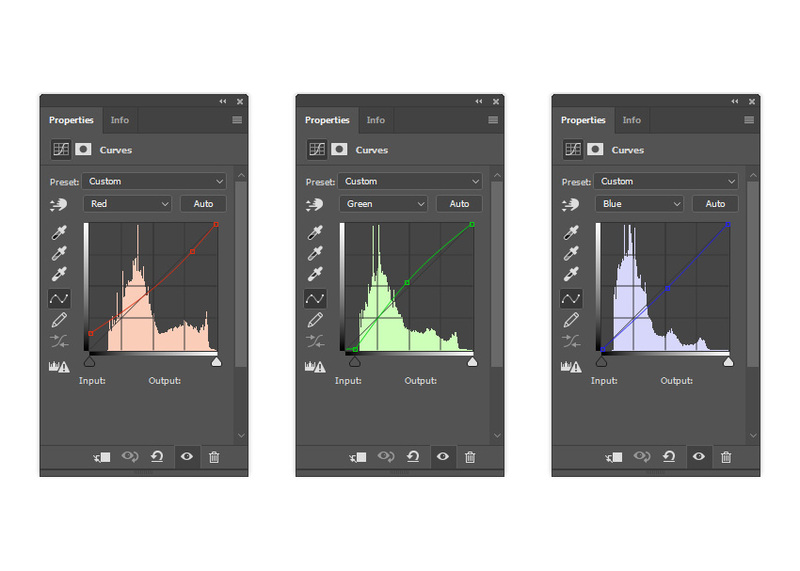 Select the Sparkles folder, go to Layer > New Adjustment Layer > Curves to create a new curves adjustment layer, and name it Color Look. Now change the Blending Mode of this layer to Overlay and set the Opacity to 10%. Go to Layer > New Adjustment Layer > Vibrance to create a new vibrance adjustment layer and name it Overall Vibrance/Saturation. Now Double-click on this layer thumbnail and in the Properties panel, set the Vibrance to +10 and the Saturation to +5. Change the Blending Mode of this layer to Vivid Light and set the Opacity to 50%. Then, name this layer Overall Sharpening. out my Magic Dust 2 Photoshop Action. will also create 15 preset color looks that you can choose from.